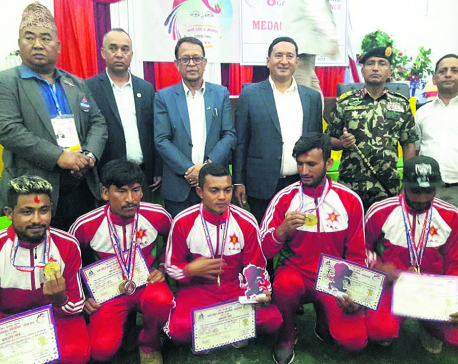 POKHARA, April 23: Departmental team Tribhuvan Army Club continued its ascendency in the ongoing Eighth National Games, winning four gold medals in paragliding event held in Pokhara on Monday. KATHMANDU, April 8: Paragliding, an adventure sport, has been included in the 8th National Games for the first time in Nepal. The national sporting event is set to start from April 18 in Province 5. 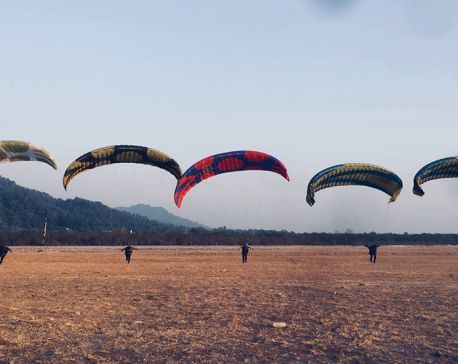 Kathmandu, April 8: Fifty-five athletes will be competing in paragliding under the Eighth National Games scheduled at different places of state 5 from April 18. 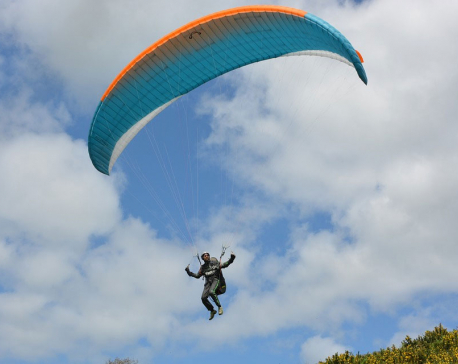 TANAHU, March 24: A test flight of paragliding has been successfully conducted in Byas Municipality of Tanahu district. Three pilots took off from Siddhi Danda and landed at Archalchaur on Saturday. Chair of Ward 11 of the municipality, Nir Bahadur Khadka, flew in the inaugural test flights. 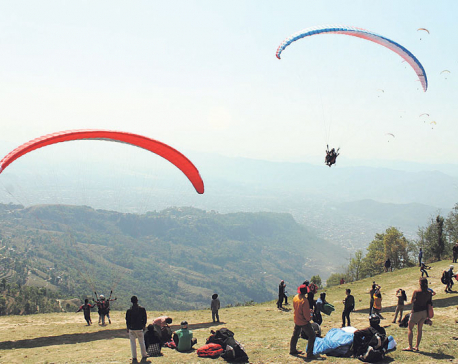 POKHARA, March 19: Civil Aviation Authority of Nepal (CAAN) has authorized Nepal Airsports Association (NAA) to regulate and supervise paragliding flights in Pokhara. 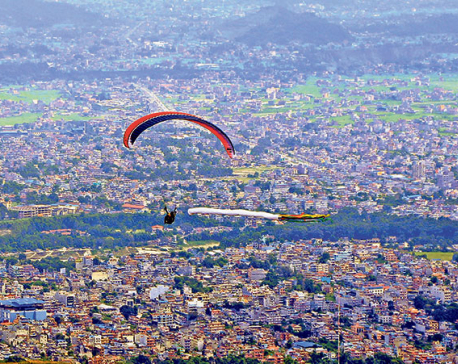 POKHARA, March 18: Pokhara Metropolitan City has decided to charge a monthly fine of Rs 5,000 against paragliding companies who have not paid the business and renewal fees. 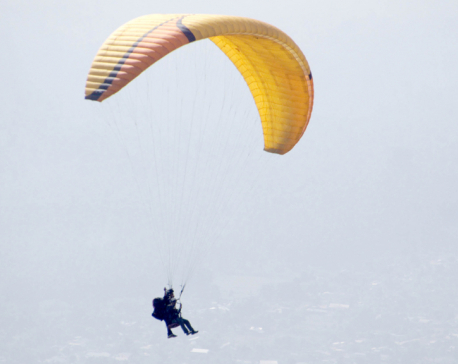 POKHARA, March 6: Paragliding service, which was said to be closed from today, has been resumed after companies, operating paragliding flights in Pokhara, agreed to pay tax to Pokhara metropolitan city. 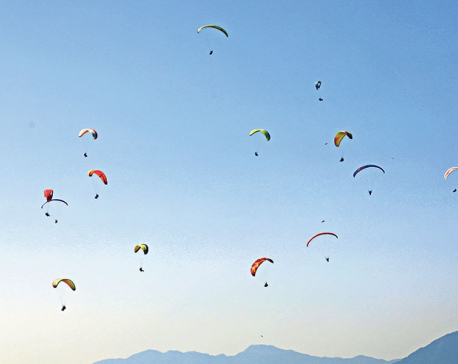 POKHARA, March 6: A paragliding tournament is being organized in Pokhara. However, neither is the organizer of the event disclosed, nor does the regulatory authority have any information about it. POKHARA, March 4: A Romanian pilot Ebe Chis Jer on Sunday succumbed to paragliding accident in Pokhara. The solo pilot had plunged into Fewa Lake after he lost control over the flight. 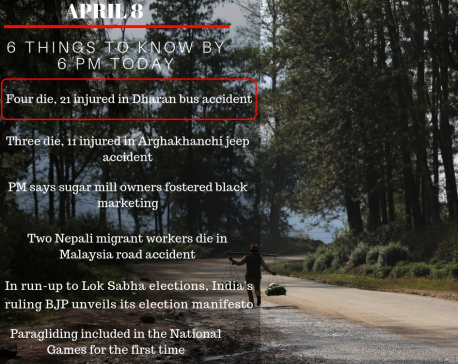 POKHARA, March 3: A Romanian citizen died after a glider met with an accident in Pokhara on Sunday afternoon. 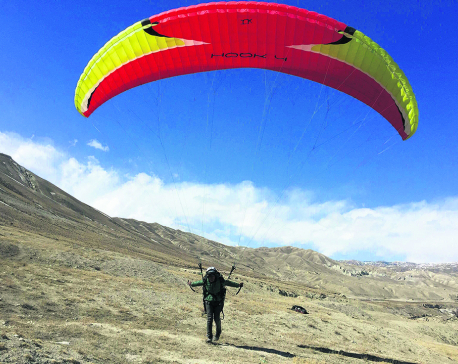 KATHMANDU, June 16: Three years after it was grounded, Kathmandu Paragliding Company has resumed operations. PALPA, Jan 15: Paragliding has been successfully undertaken at Rampur of Palpa district. Its successful test was done on Monday at Rampur Municipality-7, Bahundanda which has abundant opportunity for paragliding. KATHMANDU, Dec 19: Dharan sub-metropolis has obstructed the work of Koshi Corridor Transmission Line, claiming that the double circuit 220 KVA line will damage the potential of paragliding from Chundanda. The local body is also not happy that the 105-kilometer-long line passes through Gorkha Park. Stunning tourism destination, Pokhara, is not just the capital of Gandaki Province. It is also a commercial hub for adventure tourism and activities like paragliding. 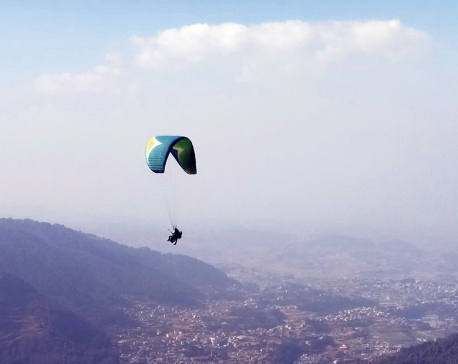 Every year, an avalanche of international tourist enjoys the surreal feeling of paragliding from Sarangkot Hill of Pokhara. Tourist can fly for several minutes enjoying the majestic view of Machhapuchhre Mountain Range and the Phewa Lake. 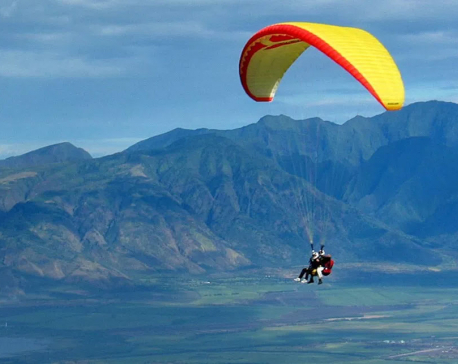 DHARAN, Nov 12: To foster tourism and create job opportunities, Udaypur‘s Belaka Municipality is giving a subsidy of Rs 50,000 to study a pilot course in paragliding. 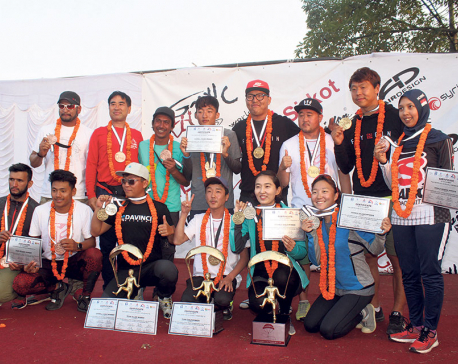 POKHARA/SYANGJA, Nov 5: Korea has dominated the overall event in the Paragliding Accuracy World Cup (PGAWC) in Sworek, Syangja in the last day of the tournament on Sunday. The Nepali players could not get to a better position despite displaying an improved performance compared to the fifth round, finishing sixth at last. POKHARA/SYANGJA, Nov 3: Slovenia has taken the lead at the end of the second round in the ongoing Paragliding Accuracy World Cup (PGAWC) being played at Sworek in Syangja district. In individual event, Nepal is currently at the fifth place at the end of the second round of matches. SYANGJA, Oct 17: A paragliding world cup championship is to be organized from November 1 to 4 at the Sworek ground of Bhirkot municipality -5 in Syangja district. SYANGJA, Oct 13: The First Nepal Paragliding Accuracy World Cup-2018 is all set to be organized in the open grassy land of Swarek Mahapur and Daunwafant of Syangja. Pokhara is gifted with geographical variances creating endless tourism possibilities. Allured by its natural beauty, the region sees abundant domestic and international tourists throughout the year. In addition to the picturesque surroundings it flaunts, Pokhara is also gaining fame amongst adventure sports enthusiasts. KATHMANDU, Aug 31: The National Sports Council has decided to provide Rs. 500,000 each to the paragliding team who won a silver medal in the ASIAD games after 20 years. 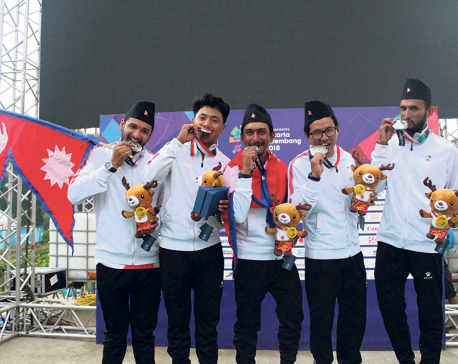 POKHARA, Aug 31: It has transpired that the Nepali paragliding players, who won the silver medal at the Asian Games -- Nepal's first and only medal in the sports jamboree so far -- had to bear the financial burden of all the equipment by themselves. Equipment for the two events, cross country and accuracy, cost the players almost Rs 1.4 million, which they managed through personal loans. 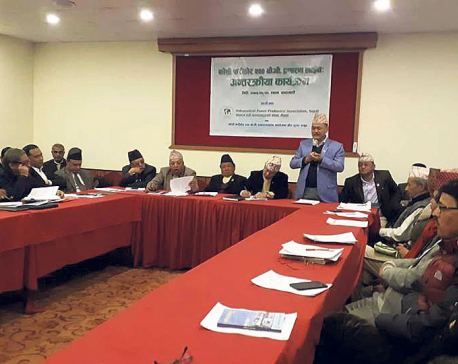 KATHMANDU, July 22: The South Asian Olympic Council (SAOC) members have unanimously voted to include cricket and paragliding as disciplines in the South Asian Games (SAG) 2019 to be held in Nepal from March 9 to 18 next year. 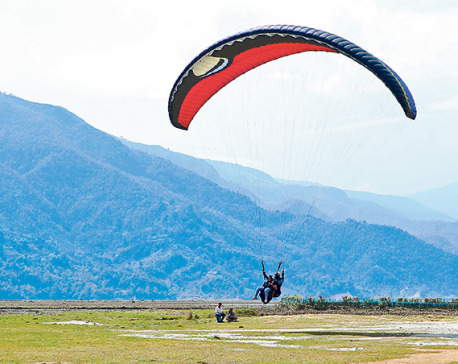 POKHARA, May 27: Civil Aviation Authority of Nepal (CAAN) has warned paragliding companies of action if they act against the laws and regulations of the CAAN. The authority has also warned both pilots and companies of canceling their license if they continue to breach the regulations. 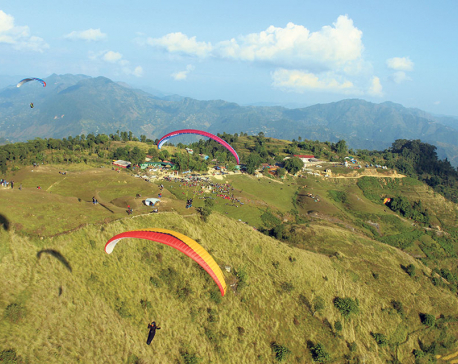 UDAYAPUR, April 10: With hopes to start paragliding services from April 14, Nepali New Year 2075, Rauta and Chitre of Rautamai rural municipality is testing paragliding flights on Wednesday and Thursday. RUKUM, Feb 18: Daniel Mayor, a Swiss national, thinks that Rukum has great potential for paragliding. 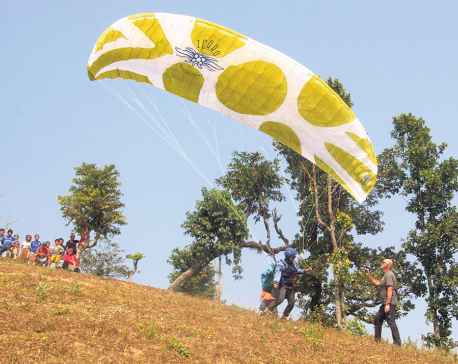 DHARAN, Feb 7: Adventure sport paragliding was successfully tested for first time at the under-construction premises of British Gorkha Simriti Park in Machamara Hill, Daran on Sunday. The sport launch aims at fostering tourism in Dharan, while also conserving the glory of Gorkha soldiers. 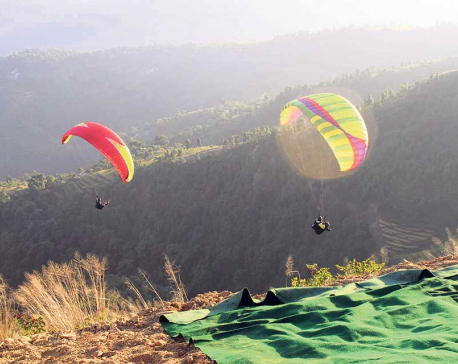 KATHMANDU, Nov 17: Shankarapur Paragliding, Kathmandu’s first paragliding company, is planning to organize a paragliding tournament in the valley in near future. 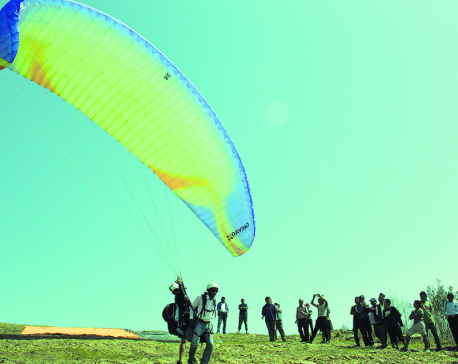 KATHMANDU, Nov 11: Paragliding, an adventurous sport, has been flourishing as a commercial tourist attraction in Nepal. In Kathmandu, it is becoming popular in recent times. POKHARA/SYANGJA, Nov 10: Nepali paragliders dominated an international paragliding competition held in Swarek of Syangja on Wednesday. According to the organizers, Nepali paragliders won all the awards on offer in the international competition. SYANGJA, Nov 2: An International Paragliding Competition began on Wednesday at Syangja’s main tourist area Sworek Ground in Bhirkot Municipality-5, Mahapur Maidan. The competition will continue till November 6. 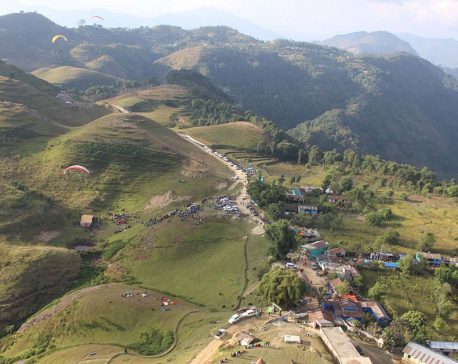 WALING, Oct 23: An international paragliding tournament is to be kicked off in Syangja from coming November 1. 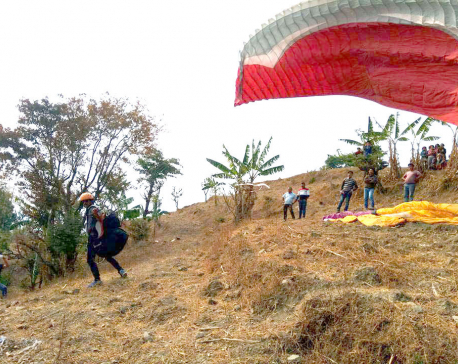 POKHARA, Oct 17: On Monday afternoon, a potential mishap of eight paragliding flights of seven different companies was averted when a sudden gust of wind pushed the flights toward Fewa Lake of Lekhnath-Pokhara Metropolis in Kaski district. POKHARA, Oct 7: Paragliding companies in Pokhara will not be allowed to operate before 10 am and after 3:30 pm now onwards. 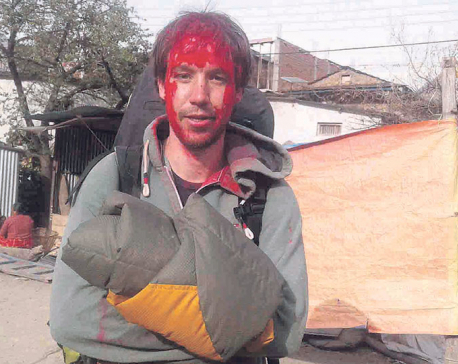 POKHARA, Feb 4: Pilot Micheal Peter Plamchapd of United Kingdom had an accident while paragliding in Pokara recently. The very next day of the accident he succumbed to injuries. 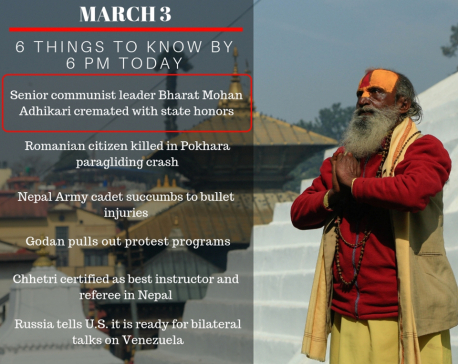 Later, it was revealed that he had not even taken permit for paragliding. KASKI, Jan 23: A British citizen died after a glider met with an accident on Monday. 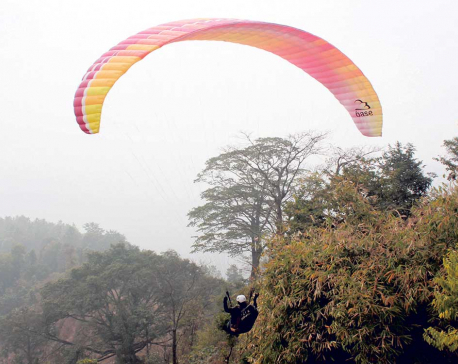 DHARAN, Dec 12: With an aim to promote adventure tourism, commercial paragliding service has started in Dharan. Budha Subba Paragliding Nepal Pvt Ltd kicked off the commercial paragliding service from Dharan-24, Ramete Danda on Monday. 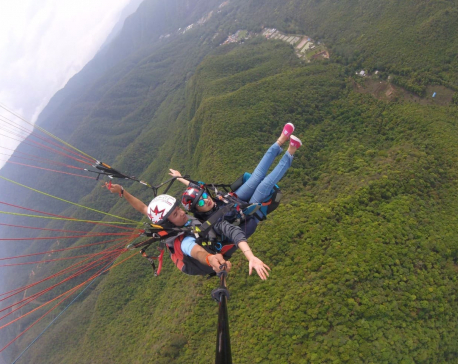 POKHARA, Nov 8: Nepal Aviation Sports Association, Pokhara has halted all the paragliding flights on Tuesday. 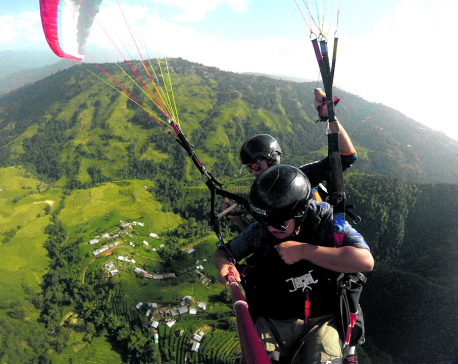 POKHARA, July 13: Blue Sky Paragliding Ltd, one of the oldest paragliding operators in Pokhara, has four pilots. But the company is not allowed to operate more than four flights a day because of a new provision enforced by Nepal Air Sports Association (NAA).